I'm going to talk about a tool I developed some days ago but I haven't finished it until today. One of the problems when you are creating a TS map in Final Alert 2 is that FA2 not reads the new palette, only the Desert palete (isodes.pal) inside ra2md.mix. 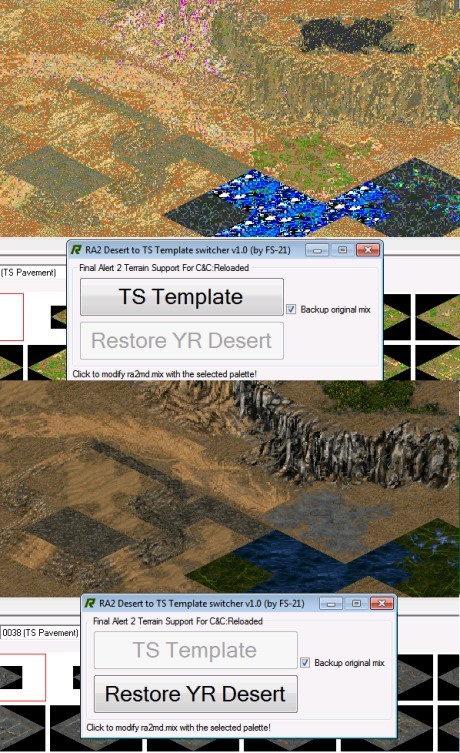 Ok so this tool patch (and unpatch ) ra2md.mix with the new colors of the TS terrain. When you have finished you can restore the original file to the original state. Tip: if you put that executable in your "C&C:Reloaded folder -> mod\" and then you enable the mod a copy in your game folder is made. Edited by FS-21, 13 July 2012 - 05:35 PM.